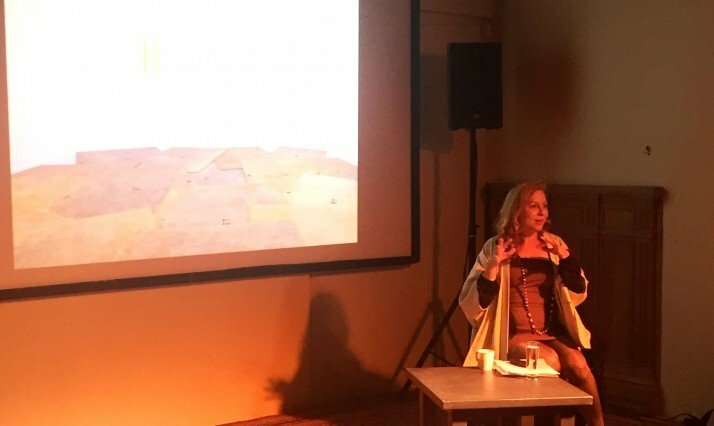 On the 24th of September, the talented Lea Porsager was to be experienced at the symposium “All is Whole” as part of the contemporary art festival Survival Kit. She participated with her Artist talk Needles needed, needy needles that is connected to her work Cunning meridians — shock therapy by way of used needles. Porsager has created this installation especially for Survival Kit and the festival was therefore the first time the public could experience this art work. The project was realized with the support of the Danish Cultural Institute. During her talk, Lea Porsager touched both her sources of inspirations, her development as an artist and presented some of her earlier works. On the photo, Lea is unfolding her solo exhibition E(ar)theric Slime that was presented at the gallery Nils Stærk.